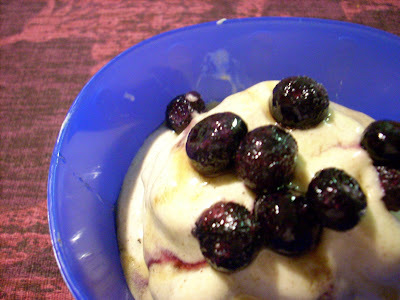 Ok ... want to satisfy your sweet tooth in an ice cream sort of way, but without all the fat and sugar ?? Here's a neat dessert I learned about a while ago but had forgotten until tonight when we were having a discussion with Jono ( our walking encyclopedia ! ) about healthy vs. not healthy food ! I used 4 bananas for the 4 of us tonight and it was WAY TOO MUCH ! I think 2 would have been sufficient ! I don't have a food processer with a bowl, do you think I could do this in the blender? What a simple wonderful dessert! Have you made it without the maple syrup? I think it would be fine in a blender ... Worth trying anyway ! I have made it without the maple syrup and it's just as yummy. Don't you like maple syrup ?